The trick to making an omelet is to practice. The more often you make them, the easier they’ll be to do. An omelet is sort of like a large egg pancake, if you’ve never had one before. The egg mixture has eggs (of course), a little milk or water and seasonings, then it is poured into a pan and cooked until just firm, before being wrapped around a filling of some kind. The most important thing is that the eggs should stay together in one round, not break apart like scrambled eggs. If they do break apart, a scramble is always an option. Without coming over and using my pans and my stove, I can’t tell you the exact settings to make the perfect omelet, if there is such a thing. I like to cook my eggs over a medium or medium-high heat until the top is still jiggly, but just set. Then, I add my filling and fold up the sides of the omelet. I always use a silicone spatula when working with eggs because it handles them more delicately than a hard or stiff tool. 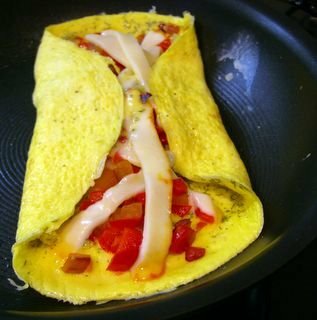 I used a blend of sweet onions and red bell peppers for this omelet, mixed a little bit of dill into the eggs, and topped it off with some muenster cheese just before folding up the sides. For the vegetables, use about 1/4 of a veggie per person. So, if you are only making an omelet for one, you don’t need to cut up a whole onion. You can, of course, use more veggies, but keep in mind that it will be difficult to fold the sides of the omelet up if your filling is too thick. 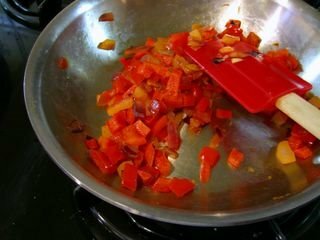 In a small skillet, sautee diced pepper and onions (see above note for the amounts) with a small amount of butter and some salt and pepper until very tender. Working over medium heat, this could take about 15 minutes. Turn heat to low while you prepare the eggs. Preheat a medium skillet over medium-high heat. Grease lightly if using a non-nonstick pan. In a medium bowl, beat the eggs, milk (or water), dill and salt and pepper together until very smooth. Pour into prepared skillet and reduce heat slightly. Cook until the top of the eggs are just set, but still jiggly, and the edge separates easily from the bottom of the pan when you slide a spatula under it. Distribute veggies in the center of the eggs, top with cheese, then use the spatula to fold up the sides of the omelet. Continue cooking until the omelet is as done as you like it (some prefer theirs slightly runny and some like them well-done). Serve immediately, preferably with toast. *Note: if you want to reduce the fat, omit the cheese and use one whole egg and two egg whites. The veggies can be sauteed in a nonstick pan, too, but a small amount of butter (only about4g fat per tsp) really makes them wonderful when they are cooked to an almost melting consistency. Next PostNext Blogging by mail returns! Quick and Delicious Breakfast ! I make something similar to this recipe occassionally but haven’t tried adding dill – will be trying that out soon!